Shari, a loyal TWDer who does cool things with classic dishes on Whisk: a food blog, chose Floating Islands (île flottante), a traditional French dessert, for this week’s recipe. I actually would have called this “snow eggs” (oeufs à la neige), but now I realize I don’t know what the difference is, if there really is one (and Googling it didn’t help, as I found different info on each link…too much information sometimes just confuses me). This dessert makes me smile; it looks kind of goofy, don’t you think? 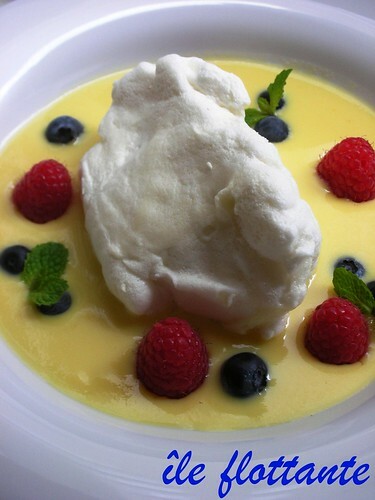 The basic idea is this: a milk-poached meringue sits in a pool of crème anglaise custard. It’s light from the meringue and, at the same time, rich from the custard…and because it’s served chilled, it’s really quite refreshing. Rather than quenelling smooth, egg-shaped meringues, I tried to make cute, spiky little islands. Unfortunately, my cute spikes flattened as I turned the meringues during the poaching process, and I ended up with deformed blobs. Whatever…looks aren’t everything. I made my meringues first, and so that I wouldn’t waste the poaching milk, I strained and remeasured it and used it as the basis for the custard sauce. Traditionally, a drizzle of caramel finishes off floating islands, but because caramel doesn’t keep, and I had to take the blog pictures several hours before I’d be eating the dessert, I chose to skip that bit. I didn’t want my islands to look barren though, so in an effort to spruce them up another way, I decided to infuse my anglaise with orange zest and garnish with a few fresh berries. And since this is an old-school dessert, I went with some old-school baby mint sprigs, just for good measure. For the recipe, read Whisk: a food blog or see Baking: From My Home to Yours by Dorie Greenspan. Don’t forget to check out the TWD Blogroll. What a lovely touch to add the fresh berries and mint. Looks delicious! So gorgeous! I love the addition of the fruit and the mint! And I think your little island is so cute! Yes it is truly beautiful. It’s an island I wouldn’t mind being stranded on. Perfect islands. The fruit and the mint look delicious. Your island/oeuf looks perfect to me! Love your idea to strain the milk and use in the custard. And your orange zest and berries sound (and look) delicious! Thanks for baking these along with me this week! so cute! i’ve never made these but i saw them on barefoot contessa and they look awesome. so elegant. Yours looks gorgeous! I love the berries floating in the creme anglaise. i say you made a fine job. However I don’t like this recipe . looks beautiful. re-using the poaching milk for the creme anglaise is a great idea. Oh, now that looks just lovely. I’m so glad to see that other people had more luck with these than I did! Totaly beautiful, Steph! It looks incredibly fresh with all those vibrant colors and different textures! Great pictures! I love the berries and mint. YUM! Blob? I see no blobs, I see something that looks great and that I’d love to try. This recipe has been on my “to try” list for quite awhile now. Great addition with the berry flourish! They look GREAT! Great tip on re-using the poaching liquid. I wish I would have seen it before I made my islands. I tried to make ricotta cheese with the poaching milk, but it didn’t work. Your presentation looks fantastic with the bright berries! They look very impressive! I wanna make them! Lovely! These look perfect. And they look so perfectly white next to the bright berries. I read your suggestion in the P & Q’s, a very resourceful idea. I see it worked well. I I like the fruit in the creme anglaise, it seem like a natural pairing. Delicious I imagine. Your islands look perfect. I had the whole inflate flip inflate then deflate syndrome. Ah well. They were delicious I thought. Your photos are as always, beautiful. I love the addition of the fruit and the mint. Very pretty. 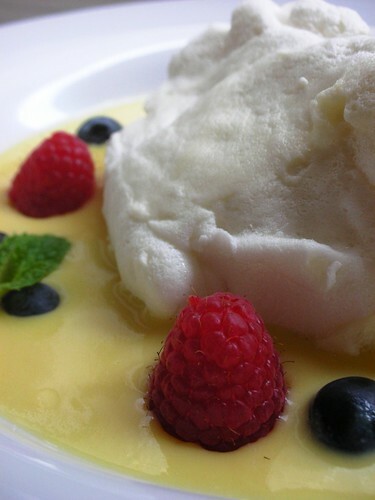 Great tips on using the poaching milk for the creme anglaise and adding the zest and berries. I’ll keep those in mind for when I finally get a chance to make this one. Your finished dessert looks lovely. These look great! Wonderful job with them! Gorgeous! Great idea to add the berries and mint. I had fun making these even though I didn’t love the outcome. How beautiful is your picture?! I seriously want to jump through my computer screen and gobble it up. Lovely, lovely job. I had to skip this week but I will definitely return to this recipe later. You have inspired me! I don’t even care how this tastes, it just looks SOOO beautiful! Oh but I’m sure it tastes amazing too. I took you up on the suggestion to save poaching liquid after making the meringues. I liked mine as well. Still at same job? I trailed in my hood. Such a classic dessert. I really like this specialty. These look so very pretty. Makes me think I should have tried making them. Trail was for Fishtail…They want weekends, I want weekday. Call them if interested. I’m also looking for apt on WEA!! Eat anywhere amazing lately? Very kitschy and elegant at the same time, not goofy! I like your “no-fuss” approach on this recipe. It looks delicious and simply stunning! That looks so delicious! Nice job. YUM. I could eat the picture. No worries – my “quenelles” were more like goofy looking blobs too. Barren islands are no good either, so I like the addition of fruit – lightens things up a bit.